Over the course of running this site, we’ve reviewed a number of different audio devices. Lots of great headphones, and a number of bluetooth speakers, but in all that time, I’ve never come across one that’s quite so easy to set up. Step 1 – Remove from box. Step 2 – Switch on. That’s it. That’s literally all you have to do. No messing with software or settings. No syncing. Nothing. My first though was naturally this is blatantly a device powered by witchcraft… It’s not of course (dammit). It’s got some clever little induction technology that will amplify the sound of any phone you place on top of it. It also has a standard 3.5mm jack on the back of the box if you want to plug an iPod or other mp3 player into it. Whilst the sound quality isn’t as good as some larger, more complex speakers, it is relatively small, and massively convenient. I’ve found myself using it at home in the kitchen as a handy way of listening to podcasts i’ve downloaded to my phone without having to mess with wires or syncing. I can see it also being good for parties, were lots of people may have music on their phones they want to play. You could just put it on the side, and let people drop their mobile on top to blare out their playlist. There’s something rather satisfying about the design too. It’s just a simple black box, but feels solidly made, simple to use, and easy to charge via a USB cable. Overall, a great little product, and for just under £20, a good price. 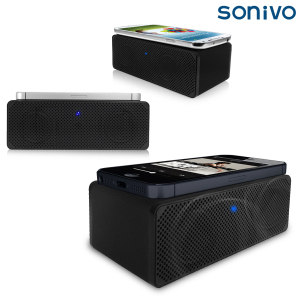 Click here for more on the Sonivo Universal Induction Easy Speaker, and other mobile phone accessories. 8/10 – Good little speaker at a great price.